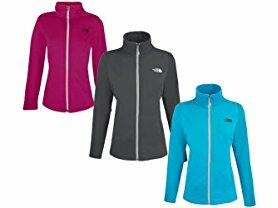 Hurry over to Woot.com because today only and while supplies last these The North Face Women's Full Zip Jackets are just $34.99 (Retail $84.95+)! Shipping is FREE for Amazon Prime Members or only $5 flat rate. The North Face Women's Full Zip Textured Jacket is a durable softshell crafted from 200-weight gridded fleece with a soft grid backer to provide the warmth, mobility and breathability you will need for all-day adventures. Spend long days outdoors with this midweight stretch-smooth-face fleece jacket.